Three years ago, the offices of the Governor and First Lady asked us to decorate the picnic tables at the Governor’s Derby Celebration. Being the arts council, a group of people who strive for perfection and who value creativity, we took the project to extreme measures by turning the tables into horses. We also wanted to include the entire Commonwealth, so we found a way to let school children of all ages participate statewide. Every year at the beginning April, we mail about 30 blank canvases to Kentucky schools that respond to our open call. They design their own “blankets,” which we drape over “horses” at the celebration. The canvases slowly return to us around the end of April, and we unroll them on tables around the office. It’s like Christmas for us, so everyone sneaks away from their work to see the new designs as they arrive. We muse about how each class came up with the concepts, how they divided the tasks and what art techniques they honed while completing the blanket. We always wonder what Derby means to Kentucky kids who, in some cases, are quite far away from Louisville. This year’s designs were phenomenal (as always). Some pay tribute to the Derby and equine culture, others focus on the beauty of springtime in Kentucky and some depict pride in both school and community. There was one from Knox County Middle School in Barbourville, Ky., that stood out among the rest. 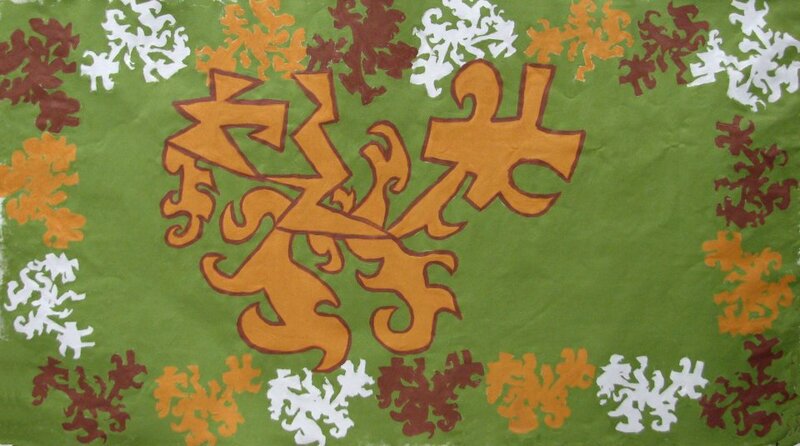 The orange, green and rust colored blanket featured a repeated motif that wasn’t a commonly recognized symbol. Derby day is one of those amazing occasions when all Kentuckians (even those living in other states) feel connected with one another. All of us experience a pang of emotion when the chorus of “My Old Kentucky Home” rings out with “Weep no more my lady…” Our hearts go out to Shane’s family, friends and classmates. Although this is a time of celebration, we will not forget that there are some of us (fellow Kentuckians) out there aching. In the spirit of being a Kentuckian on Derby, I would encourage you to visit Shane’s blanket draped over one of the horses on the Old Capitol lawn on the morning of May 05, 2012. Wonderful! I grew up in Kentucky and will always be a Kentuckian. This kind of compassion and caring is common in the hills and mountains of Kentucky. May you all be blessed.